Drones will transform the way buildings are designed, the way they look and the way they are used, according to architect Mark Dytham. Dytham, co-founder of Tokyo-based studio Klein Dytham Architecture, said that unmanned aerial vehicles (UAVs) would soon replace road transport for deliveries, meaning buildings would start "sprouting branches" for them to land on. Further ahead, people-carrying drones would lead to a complete rethink of the way buildings work, since occupants and visitors would no longer need to enter at ground level and could instead fly directly to any floor. This will begin to alter people's spatial perceptions, as they get used to seeing the world from the air rather than just from the ground. Dytham already uses a quadcopter to survey sites, inspect construction quality and photograph completed buildings. But he said the next few years would bring more dramatic changes, as battery technology improves and UAVs become able to carry heavier loads. UAVs will start to become a key mode of transport in urban areas, he predicted, which would further change the form of buildings. "You'll be able to land on a balcony,” he said. "You'll be able to land on a roof and other perches. Architecture will start sprouting branches for you to land on." Delivery companies were already making plans to deliver goods via drones, he said, which would save time and reduce road congestion. "One of the biggest problems in cities right now is all these vans delivering things to buildings," he said. "In future, deliveries will be landed on the roof by a drone. It's a profound change." Since the first experimental drone delivery company launched in 2013, interest in using autonomous flying machines to dispatch goods has rocketed. Amazon is investing heavily in drones and last December made its first commercial delivery, using a UAV to deliver a bag of popcorn to a home in Cambridgeshire, England. This would change the fabric of cities, Dytham said. "Warehouses that are outside the city will get smaller and come closer to the city to be within range of battery-powered drones. Cities won't have to repair their bridges and roads. 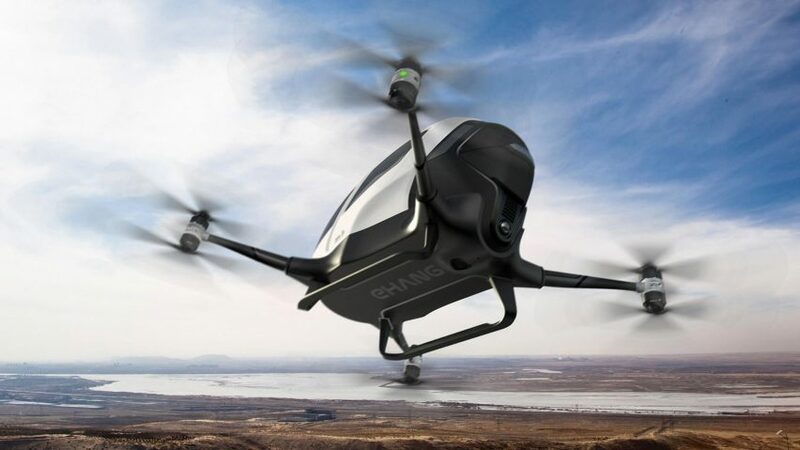 We're going to be flying 50 or 60 kilometres in 20 minutes in drone taxis." Dytham bought his first drone two years ago and immediately began using it on projects, for example to explore sites and photograph completed buildings. He recently upgraded to a Mavic Pro, a folding quadcopter that boasts a 4k camera and which can be controlled by a smartphone. "It gives a different spatial awareness of the site," he said. "Recently we were working in the countryside and we needed to survey the trees. Getting a tree survey is very expensive but we can do that very easily with a drone. We flew the drone at a height of 100 metres, and assembled the photos in Photoshop. We surveyed the site in a morning, we printed the photos out and calculated the canopy sizes of the trees." Dytham uses the Mavic Pro to photograph his firm's buildings from both the outside and the inside, using its "tripod" mode to capture still shots as well as movie footage as the drone moves around. As drone photography becomes more widespread, architects will start to consider how their buildings look from the air, he predicted. "You've got to be careful what your roofscape looks like now," he said. "You can't just dump all the plant on the roof any more. You've got to be really careful where you put things." Another benefit of drones is their ability to fly close to buildings and spot problems, said Dytham, who recently used his Mavic Pro to identity the cause of a leak on the roof of his sister's house. "For building maintenance, to fly round a building and look at what's wrong, the potential is phenomenal," he said. But the longer-term impact of the technology is more profound, he believes. "When I got my first drone I instantly realised this is how we're going to travel in future," he said. "In five years time we're going to get into a vehicle with propellers on it and travel around." His comments chime with comments made last year by transport designer Paul Priestman, who told Dezeen that electric-powered, single-person flying vehicles would be commonplace in future. "We've got these electric drones flying around everywhere," he said, adding that passenger-carrying electric aircraft were just scaled-up versions of drones. "I think that's going to get really interesting," he added. "It could be the beginning of personalised transportation." Earlier this month German company Lilium successfully tested a two-seater electric jet aeroplane designed to compete with taxis in cities. Mark Dytham runs Klein Dytham Architecture with co-founder Astrid Klein. Recent projects include a domed community hall in Soma for people affected by the 2011 Tōhoku earthquake and Tsunami, and a public convenience with a digital facade that was named Japanese Toilet of the Year.